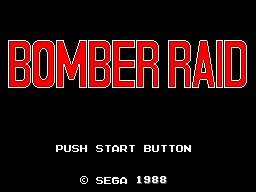 Bomber Raid (ボンバーレイド) is a Sega Master System game developed by Sanritsu and published by Sega in 1989. It is notable for being the last Master System game to be released in Japan. It is a shoot-'em-up game, where the player pilots a small "freedom fighter" aircraft, destoying other planes and ships. Game's cover is misleading as it shows a modern jet plane (which looks strangely like SR-71 Blackbird, which wasn't even a fighter plane) but in game, players take control of a World War 2 era propeller driven fighter. Activision may have intended to release the game under the title Super River Raid (tying it into an earlier game of theirs). Main article: Bomber Raid/Magazine articles.